Things are coming along in my craft room. I've called it a laundry room ever since we moved in two years ago, but that's slowly been changing. Over the past few months it's truly becoming a craft room that just happens to house the washer and dryer. 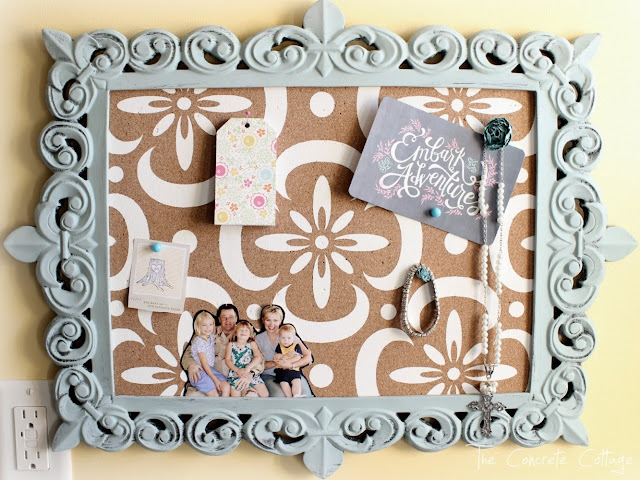 One of the things I knew would end up in this space was the cork board that used to be in our garage entryway. It needed a wee bit of a makeover to fit in with this fun new space, so that's what it got. The during... with a stencil I made using my Silhouette and cut out of Contact paper. If you recognize the pattern, it's probably cuz you've seen it on this amazing floor.